I use a gigantic expensive machine to make the world’s worst table. The entirety of this week’s assignment description was “make something big”. Tables are pretty large as far as large objects go, and simple tables are relatively easy to design for people like me without extensive experience in the world of physical objects. 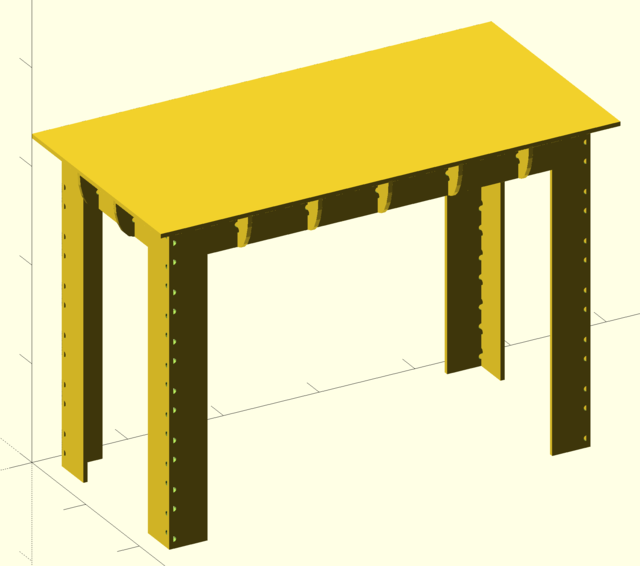 I used OpenSCAD to plan out the pieces of my table and visualize what they would look like when assembled, as well as to lay them out for cutting. The design is entirely parametric, like in Week 1, to allow recomputation for various end mill sizes and material thicknesses. The frame is held together by box joints modified to work with CNC. 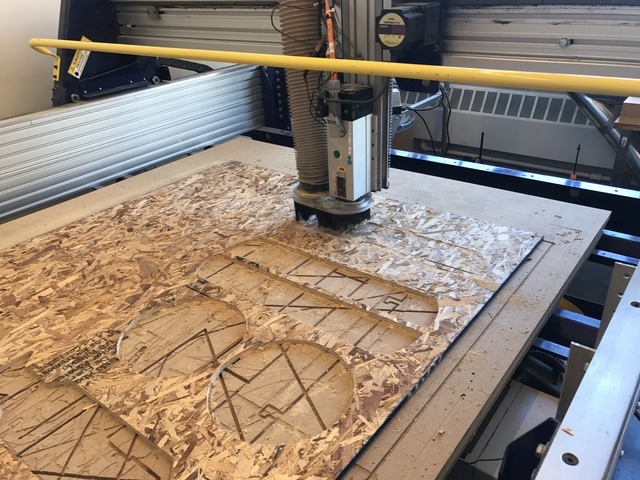 Because CNC routers cannot cut sharp corners (due to their use of a circular cutting head) we insert circular cutouts at certain places to allow the entire area of the slot to be accommodated. Individual structural members in the reinforcement webbing under the tabletop are held together by overlap joints modified to work with CNC. These work exactly like the joints in our press-fit kits. Similarly to the box joints, circular cutouts allow the machined slot to fit perfectly with a corresponding slot of the same size. 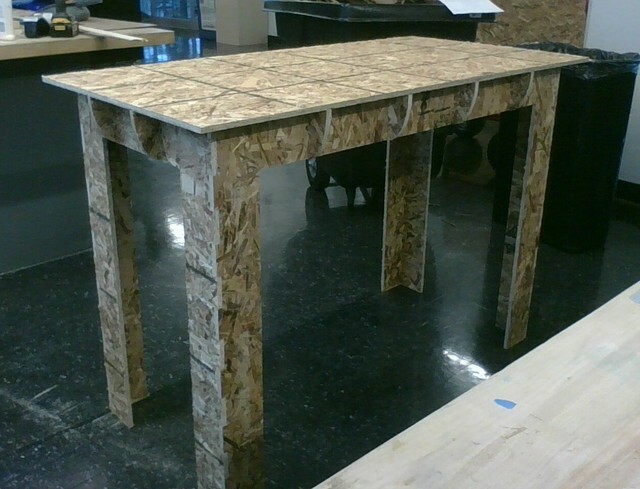 The tabletop itself is aligned using dado joints – essentially grooves in the tabletop underside. 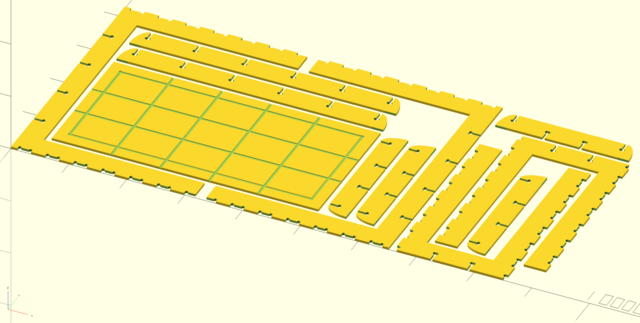 From OpenSCAD I was able to export the table pieces laid out for cutting into an EPS file, which can be imported directly into PartWorks (a ShopBot-only build of VCarve). To realize the physical table we were given 7/16” oriented strand board. This material, while cheap and reasonably strong along its strong axis, is fairly unpleasant to work with (emitting splinters at the slightest provocation) due to its composite nature. Work gloves were essential to safe handling of this material – luckily I had a pair available from an unrelated context. The actual machining, on the ShopBot CNC router in the International Design Center, took probably close to an hour in aggregate. While I tried to lay out my pieces such that they would all fit on one 48” x 96” sheet, this ended up not being necessary due to several instances of test-cutting pieces and packing in some pieces on the same sheet as some of natalie’s stuff. After cutting pieces I assembled them by hand. The tightness of the fits varied considerably. Some joints were a loose fit, while others were a respectable – or even quite strong – interference fit. There is considerable variance in thickness even among the same sheet. I was actually surprised to find that the box joints along the frame hold together entirely by friction as well, which I did not expect. Since the machining timeslot day and busy schedule for the space left little opportunity to conduct any post-processing, I haven’t had a chance to do things like sanding or gluing yet – vhich would be important to prevent the table from disassembling under torsional forces. 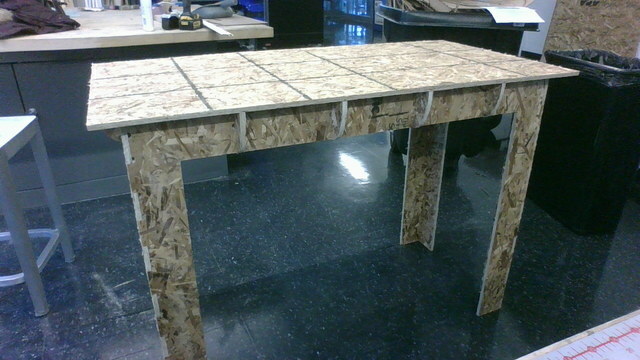 The result (for now): the world’s least attractive press-fit table!